WHERE DO REFUGEES IN TURKEY COME FROM? This page has been archived and is now provided for reference purposes only. The information on this page was last updated in October 2017 and is likely outdated. For up-to-date information, please go to our homepage. Turkey hosts refugees from many countries. According to the UNHCR, as of October 2017 there are approximately 3.2 million Syrian refugees in Turkey. Turkey also maintains a significant non-Syrian population. 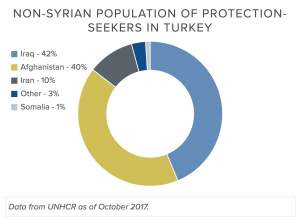 As of October 2017, of the non-Syrian population of protection-seekers in Turkey: about 44% are from Afghanistan, 42% are from Iraq, and 10% are from Iran. The remainder are from other countries around the world. In 2006, there were a total of 4,550 individual applications made for asylum in Turkey. In 2011, that number stood at 16,000. In 2013, it was 44,800. By 2014 it reached 82,000 and in 2015 the number exceeded 100k. In the first 10 months of 2016 the number of new applications in Turkey has remained in line with these yearly increases. These figures do not include Syrians (see info on Syrians in Turkey below). The new applicants, combined with other pre-existing populations and new-comers who have not been able to register yet, come to a total of approximately 328,000 individuals as of mid-2016. In 2016, the majority of clients (89%) served by RSN-RRT came from 5 countries: Syria, Iraq, Iran, Afghanistan, and Somalia. Beneficiaries from 28 other countries also received services. This means that Turkey assumes full responsibility for refugees coming from countries that are members of the Council of Europe. For those coming from outside of this zone, Turkey may grant limited protection in the form of one of many temporary statuses (conditional refugee status, humanitarian residence permit, or temporary protection). In turn, individuals qualifying for international protection may be granted an ability to stay in Turkey and not be subject to return to their home country, but must ultimately find a long-term solution outside Turkey. They do not have the ability to integrate into Turkish society. The Turkish Parliament passed new landmark legislation, the Law on Foreigners and International Protection (LRIP), in April 2013, The new law went into effect in April 2014. The new law made a number of changes to the asylum system in Turkey, mainly with regard to legal procedures and bureaucracy. The ultimate character of the system, however, has not changed. The geographical limitation remains in place under the new law, leaving most refugees with no long-term solution in Turkey. Asylum-seekers in Turkey apply to the Turkish government (to the Directorate General for Migration Management) for international protection. Depending on their circumstances and country of origin, they may be eligible to apply to the UNHCR. Individuals coming from Syria fall under a group-based designation, Temporary Protection, under Turkey’s Law on Foreigners and International Protection. Syrian nationals apply directly to the Turkish government and do not undergo individual status determination with UNHCR. Based on vulnerabilities and other criteria, Syrians may be referred by the government for resettlement to a third country. Approximately 3 million Syrian refugees currently live in Turkey. The Temporary Protection status they fall under was largely based on a European Union Directive of 2001 which outlines EU member states’ obligations in responding to a mass influx of displaced individuals. Such a status (temporary) is common in the face of such numbers, as no country’s asylum system could conceivably process so many individual determinations. Temporary protection for Syrian nationals allows for access to basic services. For more information on the rights afforded with such status, see RSN-RRT’s booklets for Syrian refugees. RSN continues to work with our local partner to monitor the situation facing Syrians refugees and support their access to information regarding their rights and to legal assistance when needed. Non-Syrian, non-European applicants are eligible to apply to the UNHCR for refugee status. The UNHCR carries out refugee status determination (RSD) procedures for this population. If a non-Syrian individual or family is recognized as a refugee under UNHCR’s mandate, the UNHCR will attempt to resettle them to a third country. This process is lengthy. UNHCR’s operation is not equipped for the amount of asylum-seekers currently applying in Turkey. Therefore, individuals generally wait years for the RSD procedure to be completed. If eligible for resettlement, the process takes even longer. While refugees wait, they are entitled to limited access to services, including medical care at state hospitals and education for primary school-age children. Although they have the right to apply for a work permit, very few refugees receive full employment authorization. Informal employment remains common in Turkey. These factors make the experience of seeking asylum and awaiting an RSD decision in Turkey difficult and vulnerable. Turkey hosts, as of mid-2016, approximately 30K individuals from Iran, seeking protection for a variety of grounds, including a lack of religious freedom (Sunni Muslims, Christian converts, followers of the Baha’i faith), as well as political activists and many individuals (including the LGBTI community) who suffered sexual and gender-based violence. Because of the importance of Turkey to Iranian asylum-seekers as a first destination of safety, RSN follows the human rights situation in Iran closely. As of 2016, Afghans account for about 35% of the non-Syrian refugee population in Turkey. This amounts to over 120,000 individuals. Afghans face many difficulties as asylum-seekers in Turkey. This is mostly due to limitations in resettlement opportunities for Afghans. Only around 500 Afghans per year are resettled from Turkey, almost entirely to the US. This has left a sizable population of Afghans who are recognized as refugees by the UNHCR but with no durable solution option available. Since passage of the Law on Foreigners and Protection in Turkey in 2014, RSN and its partners have been engaging with the Afghan community and with the Turkish government, as well as INGO’s and local organizations, to try and explore possibilities for this community. Iraqis are the largest group of individual protection-seekers in Turkey. As of 2016, Turkey hosted approximately 125K displaced Iraqis. This is an alarming figure, considering that at the end of 2011, that number was only around 10K. Intense turmoil in Iraq over the last few years has brought many recent arrivals to the already steady figures seen in Turkey, going back to the aftermath of the invasion and overthrow of the Saddam Hussein regime in Iraq. People leave Iraq and come to Turkey to save their lives due to sectarian issues, while many others flee ethnic tension. Still others, such as women and LGBT individuals, face compounded difficulties and risks in Iraq because of their identity. While less discussed in the media, Turkey is also a destination for refugees from many other countries. In recent years, RSN has provided service to refugees from countries ranging from Cameroon to Turkmenistan. While the situation causing individuals to flee from these countries differ, RSN is committed to providing all refugees with the opportunity to legitimately file a claim for refugee status and have adequate counseling and assistance as they undergo the determination process.